You might think that teaching in a South Korean elementary school would require some understanding of Korean, but you’d be wrong. Leaving my corporate job in the U.S. to teach English in Seoul has been a remarkably easy transition. My English language classes are always accompanied by a co-teacher—a school-appointed Korean teacher who fills in the translation gaps. In fact, I am encouraged not to speak any Korean in order to give the students a completely immersive experience. My favorite are the third graders. Though the older students understand me better, the third graders are still young enough to be excited to learn a new language, and their excitement fuels my own energy. They listen eagerly and intently to my lessons and then listen even more intently as my Korean co-teacher offers a translation for the parts they don’t understand. 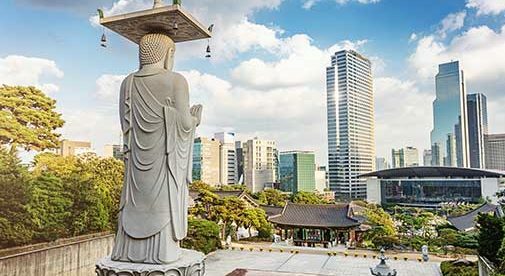 With nearly every public school in Korea hiring English teachers from overseas, finding work here is easy. But teaching English is just a pastime for me, a way to make some money while I explore Korea. When classes finish for the day, I am off on a new adventure. My friends, from Australia, South Africa, Ireland, and the U.S. are all fellow English teachers. We meet in the evenings in cafés and share stories from the classroom, while excited discussions of weekend adventures float through the air. I’ve lived here for over two-and-a-half years, but Korean food is still exciting and delicious, and we are always finding new restaurants to try together. A Korean barbecue might consist of eight different flavors of pork belly—ginseng, wine, pine leaves, garlic, herb, curry, miso, and spicy—and is rarely served without an abundance of side dishes. At the price of only $8 a person, we are able to eat out freely whenever we want. Once we’ve eaten ourselves into lethargy, we return to our apartments and neighborhoods connected by the web of metro lines buried beneath the city. While weekdays comprised of cafés and friends, weekends are for bus trips and metro rides to new cities and towns. The public transport system reaches far and wide and is simple to use without speaking a word of Korean. The most memorable trip I have taken so far was to a beachside town called Sokcho on the east side of the South Korean peninsula. I found it through a simple internet search, booked a ticket on my phone, and in just three hours traversed mainland Korea, from the west coast to the east. When I hopped off the bus, the salty sea air overwhelmed my lungs. There was a tourist information booth immediately by the bus stop, with an English interpreter who helped set me up in a cheap hotel and gave me a map of the area with points of interest. I picked a few and quickly scheduled out the next two days of adventure. In a blur of walking and summer heat, I visited a port town with over fifty seafood restaurants and stalls, a village inhabited by North Korean refugees, a traditional market that sold region-specific foods, and a beach where you could buy fireworks and shoot them off on your own at night. It was two days and one night of pure bliss, with discoveries at every turn. I would later return to Sokcho four more times with different expat friends, proudly showing what I considered my discovery. The school contracts not only pay well, but they also provide housing, healthcare, national pension, and severance. Living in South Korea isn’t as cheap as Southeast Asia, but a hearty soup with rice and several side dishes only costs about $4 to $5. And as long as you are a native English speaker, getting a job in a public school, private school, or after school program is as simple as submitting an application. I didn’t even have any teaching experience prior to South Korea. Since I uprooted my life from corporate America and moved to South Korea, I’ve had no regrets. The ease of setting up a life here has been unbelievable, and the food and domestic travel options just add to the appeal. A few years ago, I never thought I’d be here, but now it’s hard to picture ever leaving.